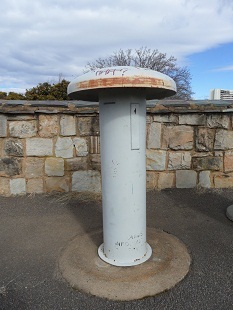 Have you ever noticed what appears to be a large metal toadstool at some Canberra lookouts? 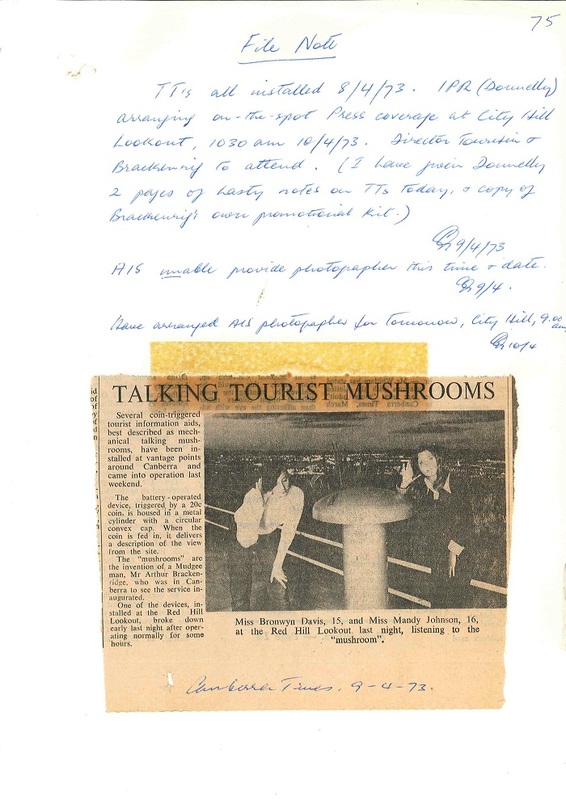 These are ‘Talking Toadstools’, coin operated information devices that played a recording describing the view visible from that location. 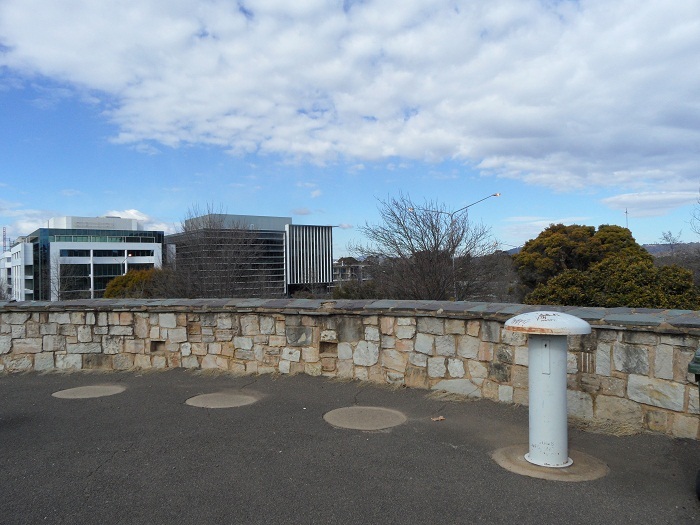 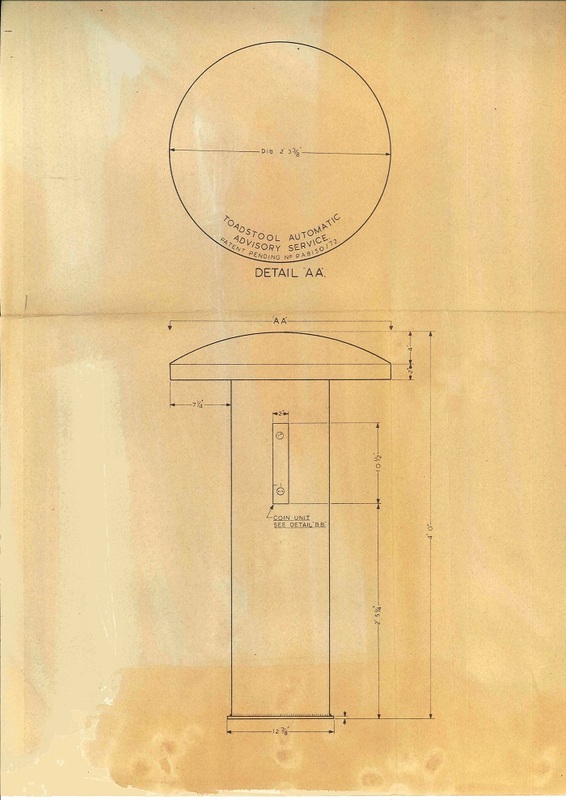 Invented by Arthur Brackenrig from Mudgee NSW, seven were installed at lookouts around Central Canberra in 1973. 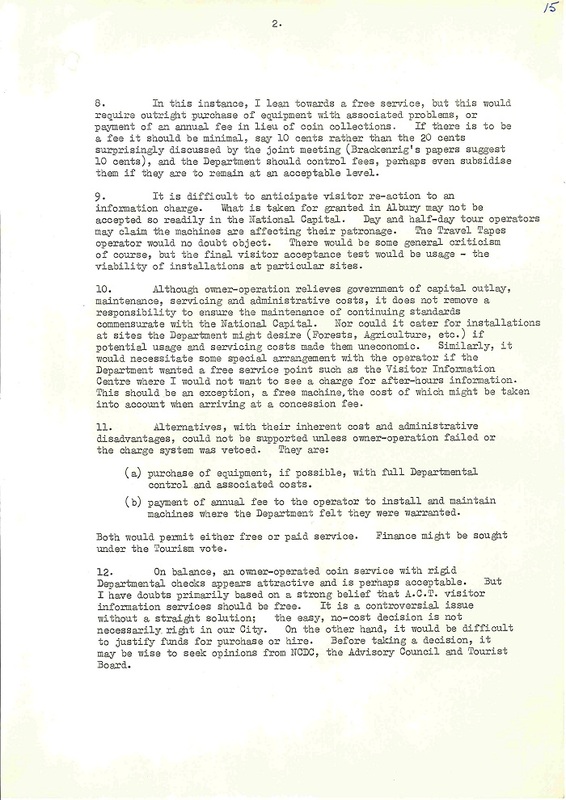 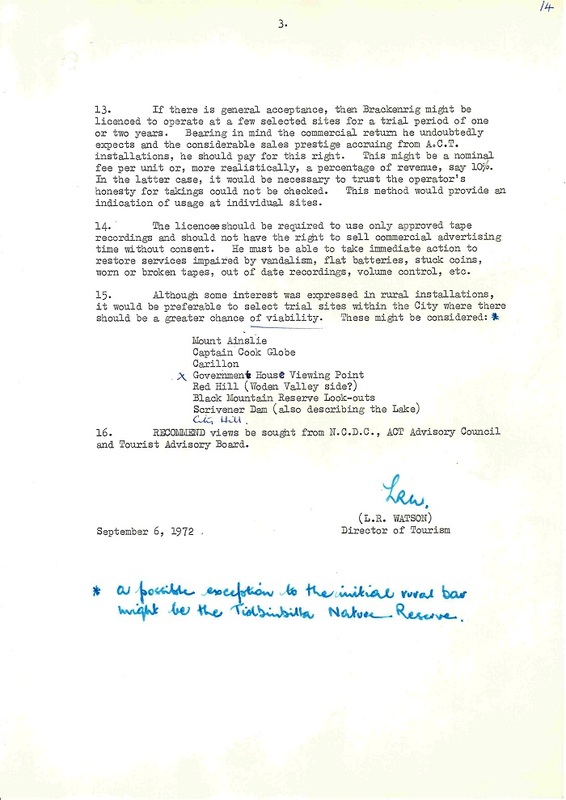 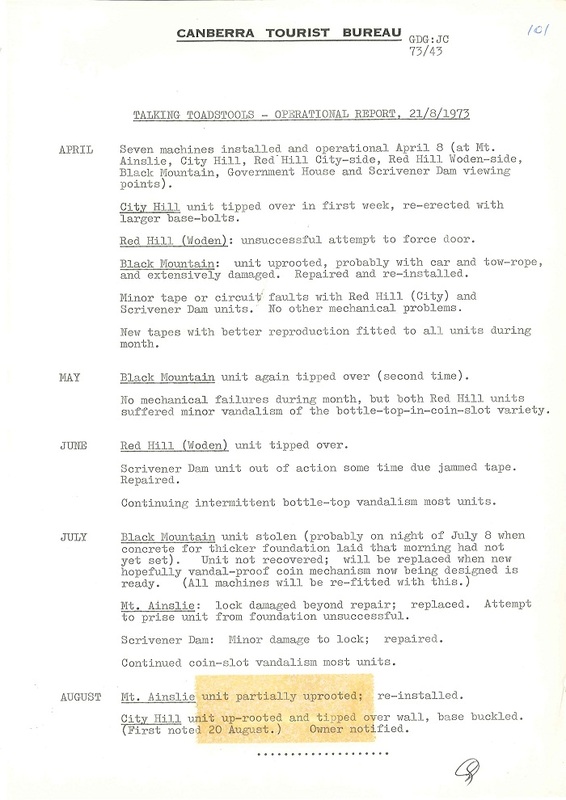 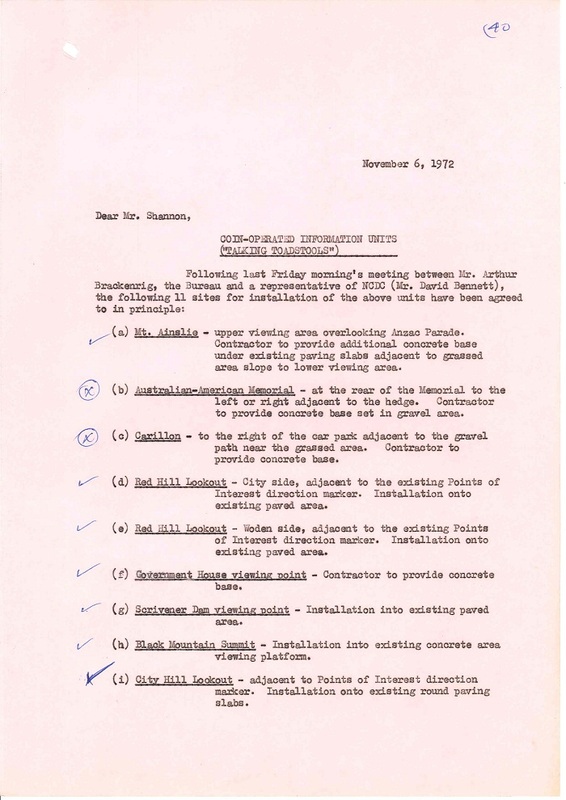 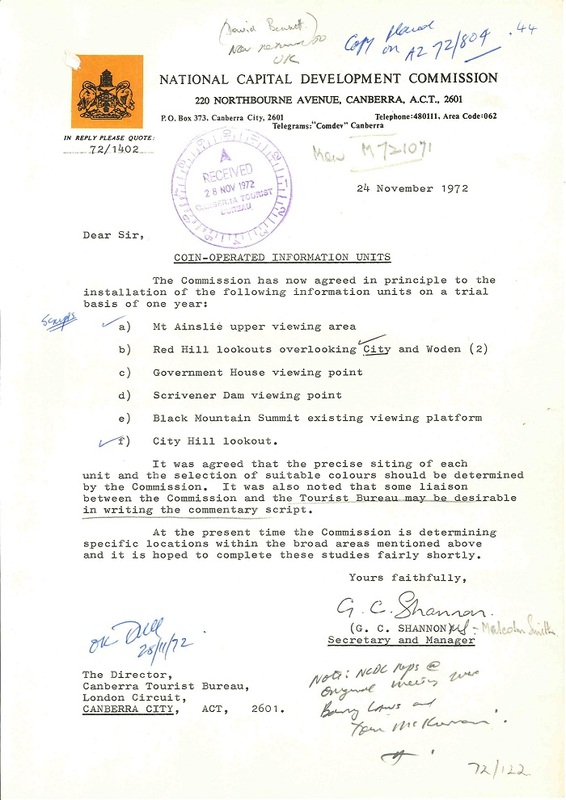 The files ‘72/0122 : Canberra Tourist Bureau – Information Machines’, ‘72/1402 : National Capital Development Commission – Toadstool Automatic Advisory Service’, ‘73/0043 : ACT Tourist Bureau – Information Machines (Talking Toadstools)’ and ‘77/0014 : ACT Tourist Bureau – Information Machines (Talking Toadstools)’ document the leasing and maintenance of these machines and the creation of the audio scripts. 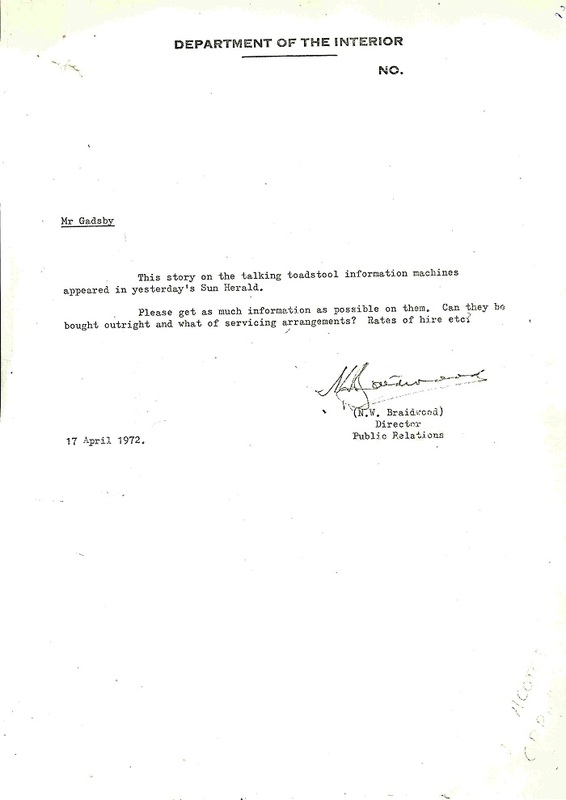 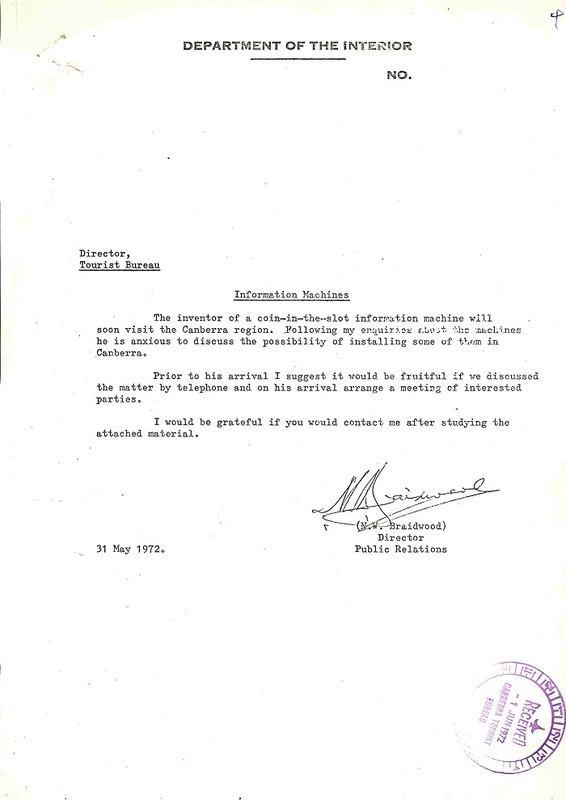 The article ‘Toadstool has the Answers’ in the Sun-Herald 16/04/1972 attracted the interest of the Director of Public Relations for the Department of the Interior, N.W. 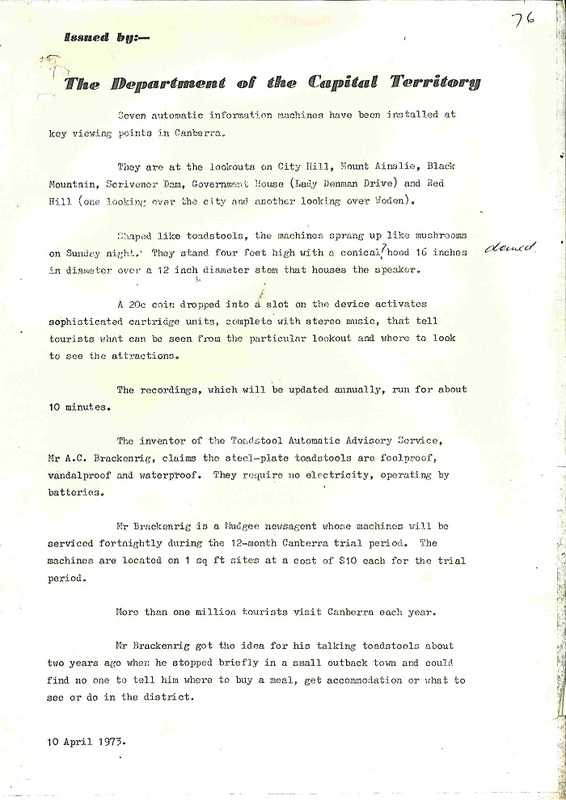 Braidwood. 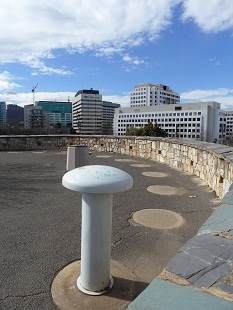 This prompted the Canberra Tourist Bureau to investigate the purchase of Talking Toadstools for tourist spots around Canberra. 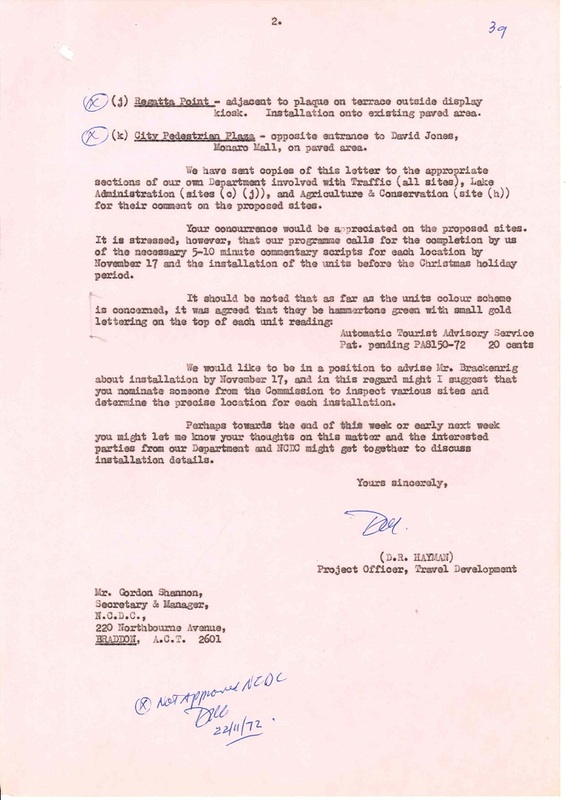 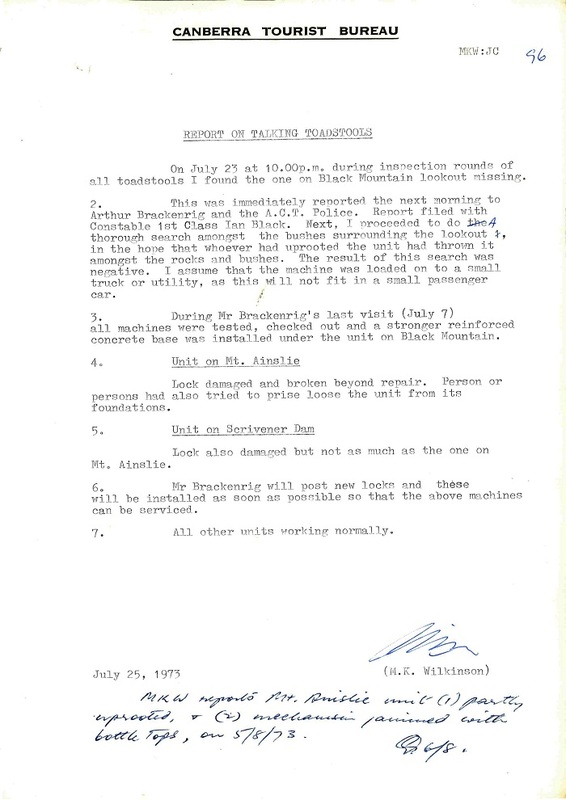 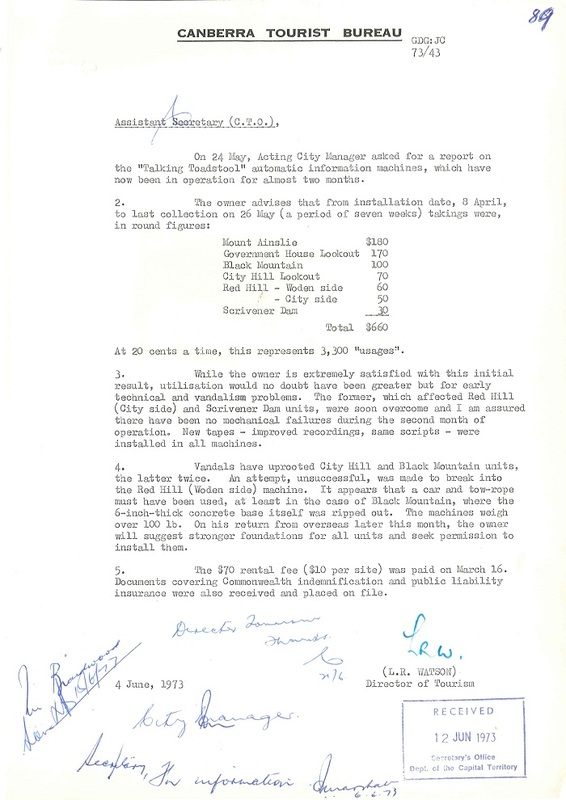 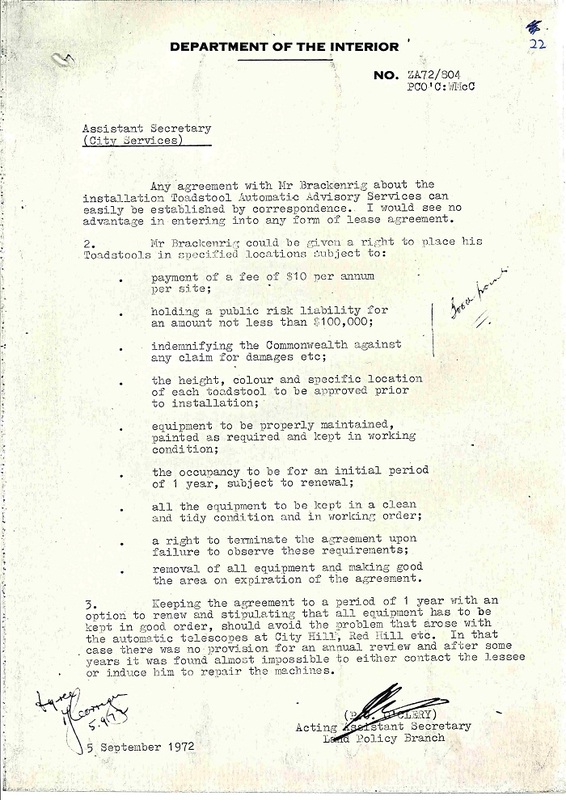 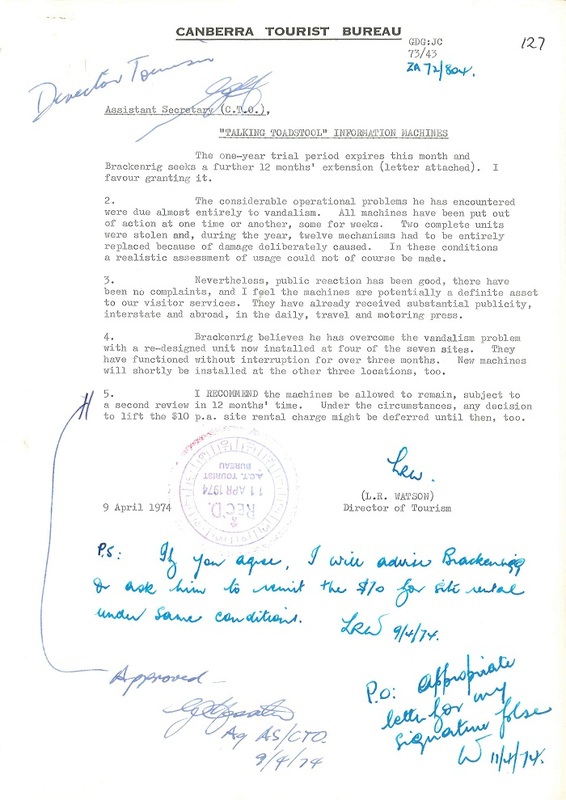 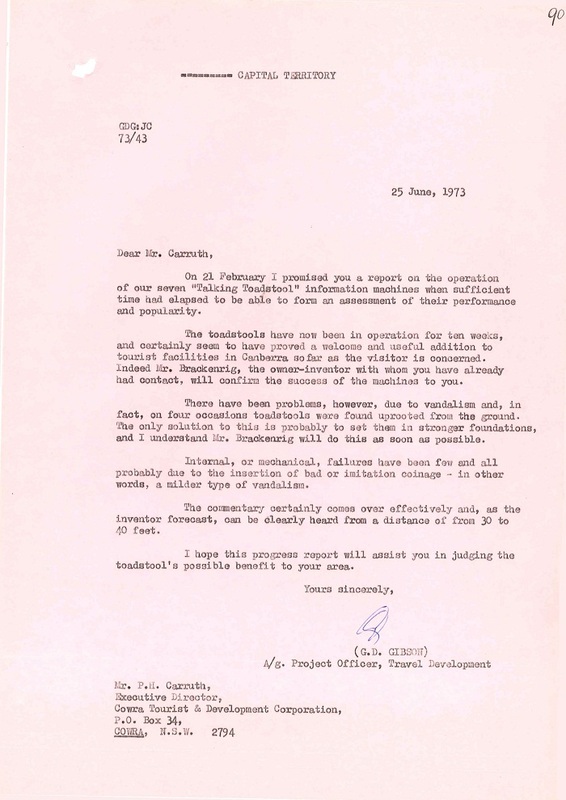 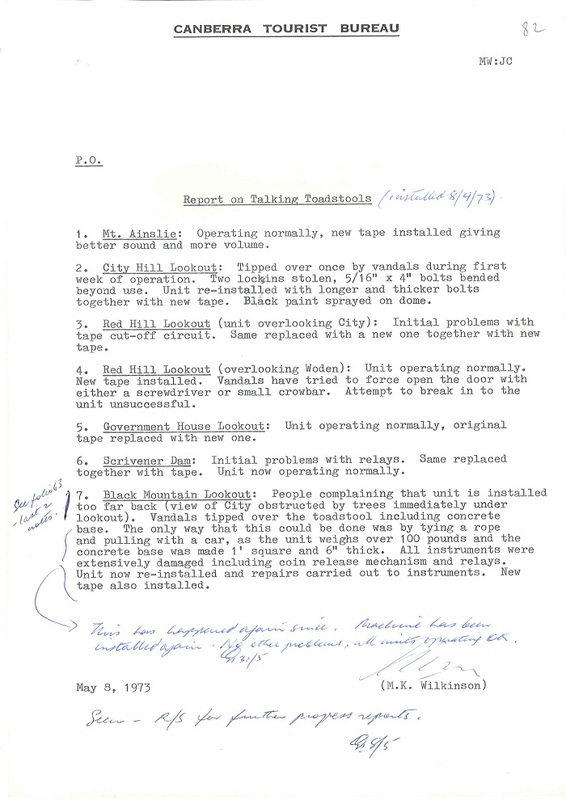 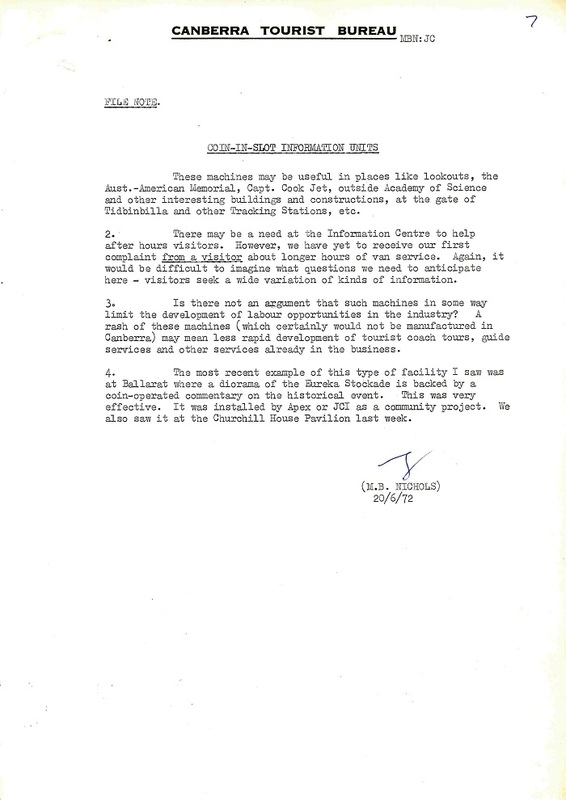 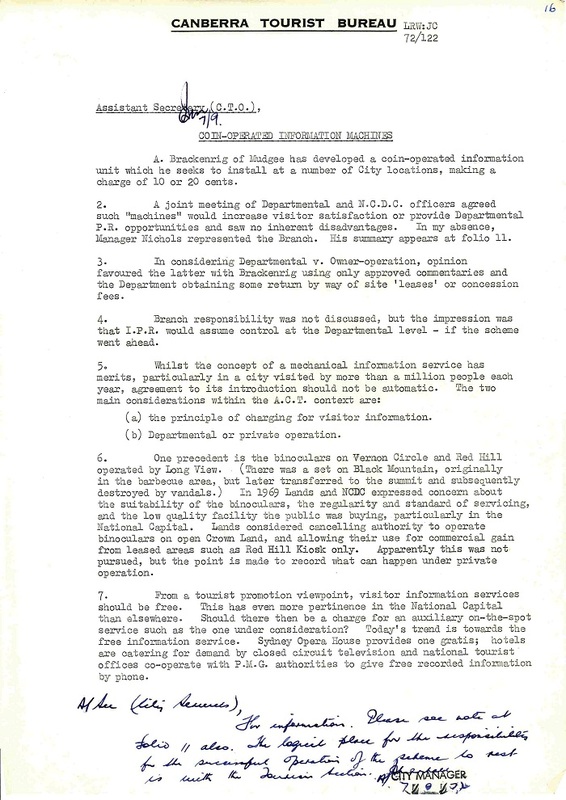 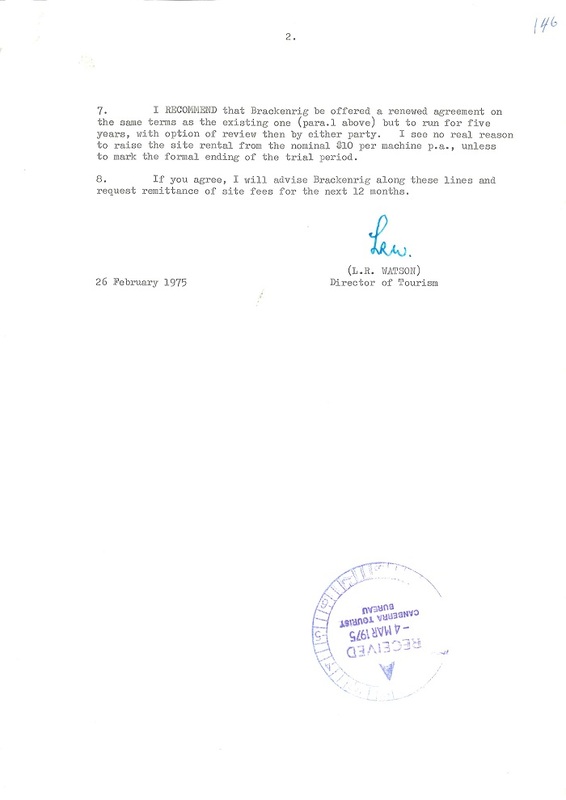 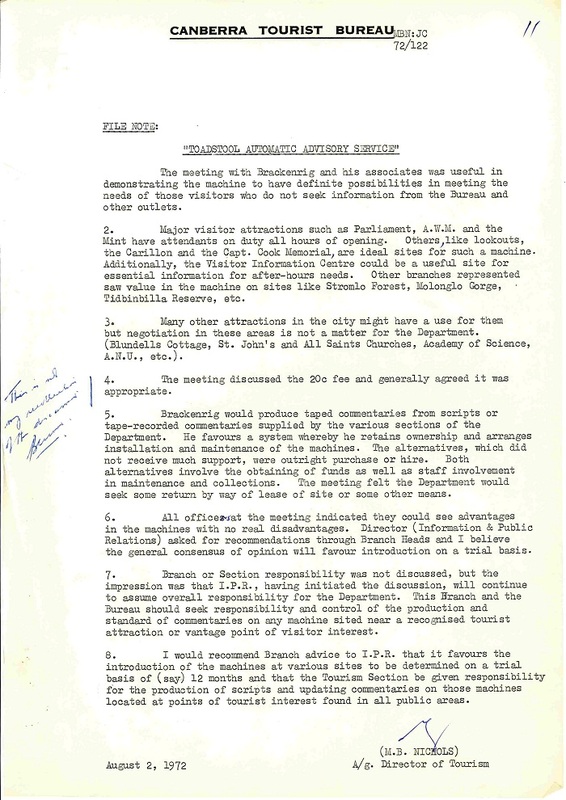 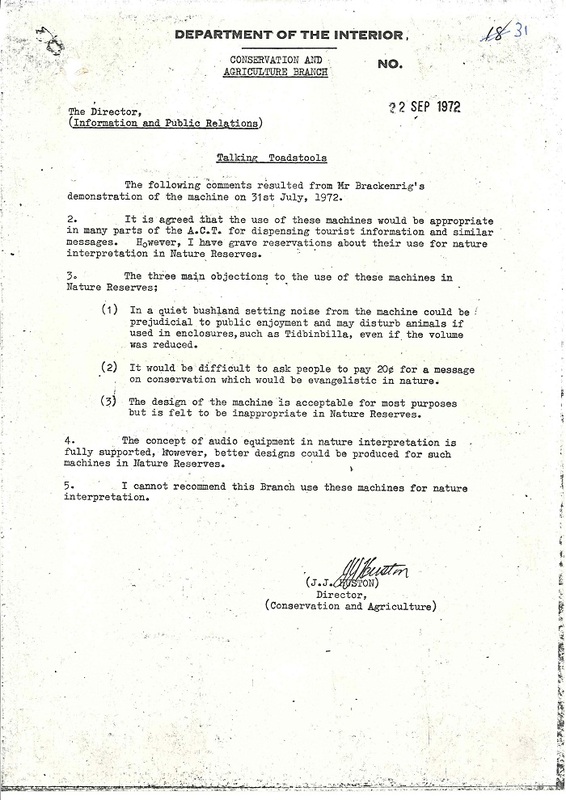 Representatives from the Canberra Tourist Bureau met with Arthur Brackenrig and his Associates from Toadstool Automatic Advisory Service on 31st July 1972. 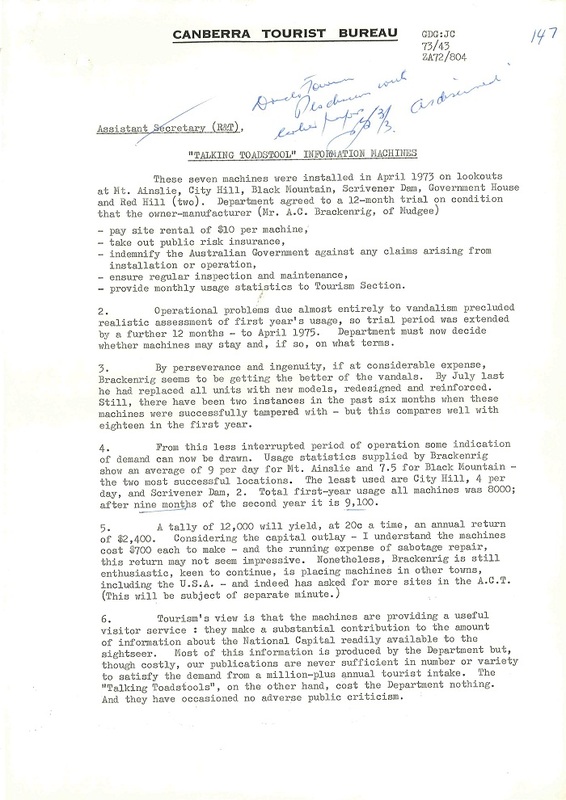 The machines could not be purchased so would need to be leased from Toadstool Automatic Advisory Service with maintenance and money collection provided by them. 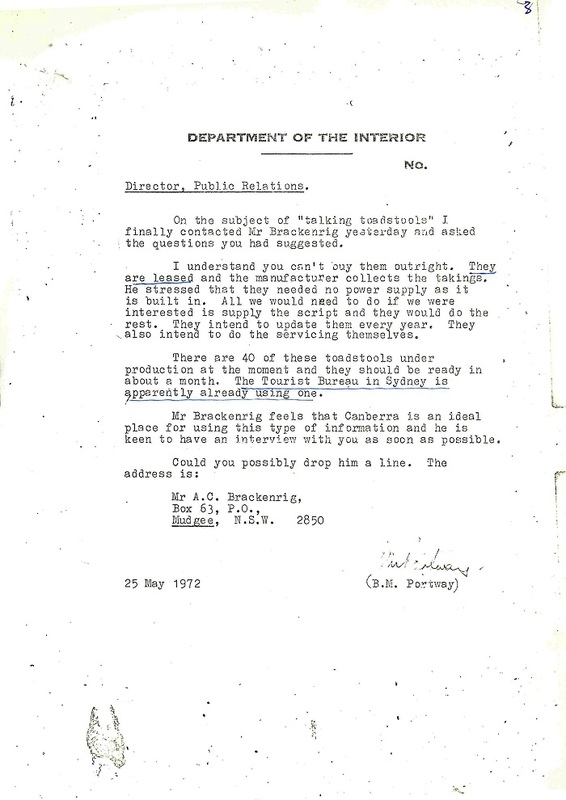 Scripts for the narrations would be provided by the Department of the Interior to be recorded by Toadstool Automatic Advisory Service. 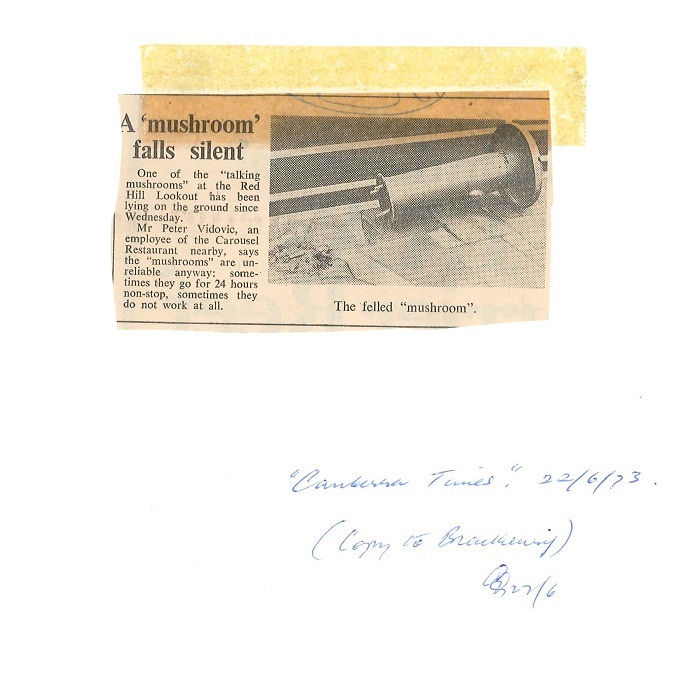 Unfortunately it did not take long for the Talking Toadstools to become victims of vandalism. 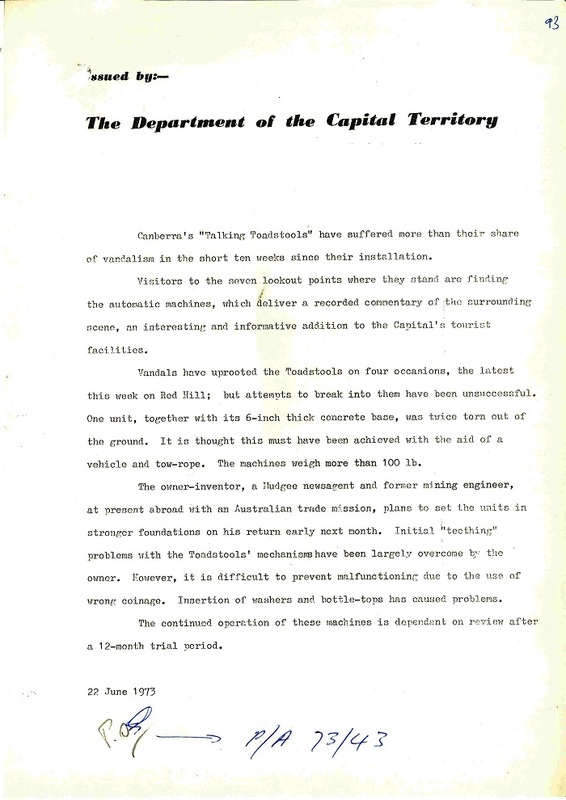 During 1973 Toadstool Automatic Advisory Service redesigned the Talking Toadstools to make them more resistant to attack. 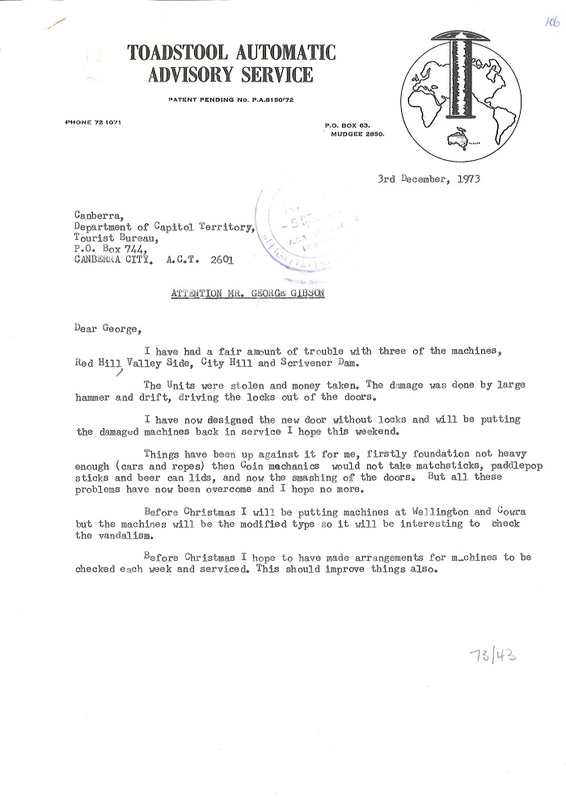 Despite these problems it was decided to allow the Talking Toadstools to remain. 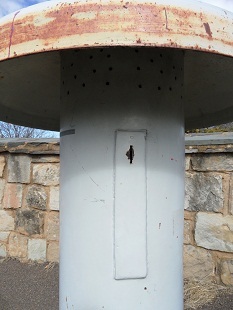 Although the Talking Toadstools no longer function, a few can still be found in their original locations such as the one below at the City Hill Lookout on Vernon Circle (photos taken 03/08/2012).